After the November 25 Brexit summit sealed the Brexit deal, volatility on GBP/USD remained capped by 1.2725-1.2865. In her effort to have the Brexit deal passed in the UK parliament the UK Prime Minister Theresa May has no clear majority of MPs for December 11 vote. The Bank of England said that disorderly Brexit would lower UK’s GDP by almost 8% and send Sterling lower by 25%. With the economic indicators playing a secondary role in Brexit saga the US trade relations with China and US non-farm payroll may decide Sterling’s value. The FXStreet Forecast Poll expects GBP/USD to remain bearish only in short-term leaving 1-month and 3-months forecast bullish. The GBP/USD opened trading during the final week on November at 1.2796, little boosted by the Brexit summit from Sunday, November 25 sealing the Brexit deal between the European Union and the UK. After hovering around 1.2800, the GBP/USD fell towards the weekly low of 1.2725 by the end of the week as prospects darkened for the US President Trump making a trade deal with China’s counterpart Xi during the G-20 summit in Buenos Aires over the first weekend of December. Sterling initially benefitted from the news of the UK Prime Minister Theresa May getting the Brexit deal approved by the European Council, but pessimism started to rule the FX market soon after as deeply divided UK parliament did not appear to be even close to passing the Brexit deal. Theresa May will need 320 members of the UK parliament (MPs) voting for her Brexit deal with only 224 loyal Conservatives being secured now. The Bank of England also jumped into the drama saying disorderly Brexit may cause the UK GDP to fall 7.7% and Sterling to depreciate by up to 25%. No-deal scenario, although not being expected by the Bank, would throw the UK economy and its currency into disarray. The Bank of England painting a dark picture of the UK economic future with no Brexit deal, the GBP/USD fell to last week’s low of 1.2725. With no economic data due in the final week of November, it was the Brexit headlines that influence the FX market with GBP/USD capped within the tight range of 1.2725-1.2865. The FOMC meeting minutes disclosed that the monetary policy statement in coming meetings might need changes, particularly in language regarding the need for “further gradual increases” in rates. That is slightly US Dollar negative as markets need to discount the chances of a fewer rate hike next year, but the key to the overall sentiment is held by the US President Trump and his will to negotiate a trade deal with China on the upcoming G-20 meeting in Buenos Aires over the weekend. The first week of December will see only marginal data on the UK manufacturing, construction, and services PMIs due, while the US marker calendar is featuring a heavyweight US non-farm payroll report next Friday. The spotlight will be on Brexit headlines as the parliamentary debate on Brexit deal starts next Thursday, December 5 before voting on the deal on December 11. The GBP/USD is trapped in the downward sloping trend on a daily chart with Momentum pointing sharply lower. The golden cross formation indicating bullish crossover of a 50-day moving average above a 100-day moving average was invalidated with GBP/USD trading at the lower boundary of a wider range. The sideways range of 1.2662-1.3300 is intact since July 17 and the downward sloping trend frames the currency moves on the upside. The Slow Stochastics is moving within the oversold territory with fundamental Brexit drivers clearly overshadowing the technicals. While bearish mood prevails with UK parliament deeply divided about Brexit deal, the immediate target is 1.2662 on the downside. On the other hand, the GBP/USD currency pair need to break above 1.2900 and 1.3000 to confirm bullish reversal and that is highly unlikely without Brexit deal approved. The GBP/USD is moving in a downward sloping trend on a 1-hour chart with the technical indicators like Momentum and the Relative Strength Index in the neutral territory. The short-term cap is at the current level of mid 1.2700s with the further potential of sliding lower to 1.2700 first before targeting the cyclical bottom of 1.2662. Before the UK parliament passes the Brexit agreement, chances are for the uncertainty to prevail keeping Sterling under pressure. The Bank of England Financial Stability Report warned of disorderly Brexit weighing on the economic outlook with possible 7.7% GDP fall and up to 25% Sterling depreciation. The Bank of England Governor Mark Carney said the disorderly Brexit is not the main scenario the Bank expects. Bank of England said "close" EU trade relationship would boost GDP by 1.75% vs. November forecasts, "less close" would cost 0.75% of GDP. The UK economic calendar is featuring only minor data on the UK manufacturing, services, and construction, with all of the PMI indices already at multimonth lows as the Brexit uncertainty weighs heavily on the economic activity in the UK. The US economic calendar features much more events compared to the UK, but the US labor market pays the dominant role. The US ADP private employment report is expected to see the number of new jobs drop to 189K in November compared to 224K in October, and similarly, the headline of next week and the most important economic report due, the US government's labor market report is expected to see number of new jobs rise by 205K in November, down from 255K in October. While the US unemployment rate is expected to remain stagnant at 3.7% in November, closely watched wages are seen rising 3.1% over the year, unchanged from October. 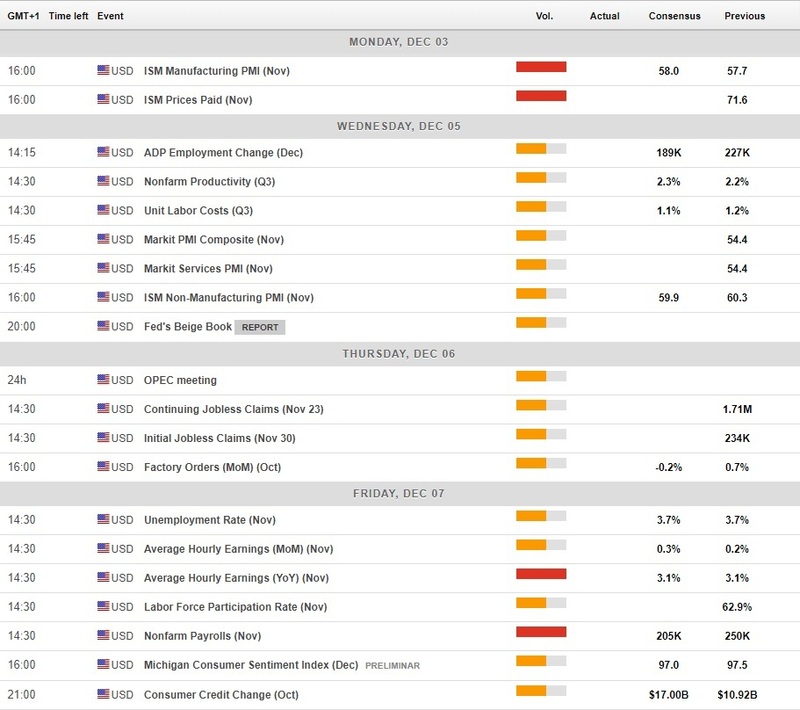 The US economic calendar will feature also minor reports on the Economic activity in the manufacturing and services sector, but in light of a hot debate about the US interest rates being close to neutral, the focus will remain on employment, wages and inflation. The FXStreet Forecast Poll estimates GBP/USD to reach 1.2743 next Friday while missing the last week's estimate by about 100 pips with spot around 1.2740 on Friday, November 30. For the first week of December, the FXStreet Forecast Poll bearish-to-bullish forecast ratio switched to 50%-44% compared to 47% of bearish versus 24% of bullish forecasts last week. Forecasts for 1-month ahead remains bullish expecting 1.2843, down from 1.2951 expected last week and even lower compared to 1.2884 forecast two weeks ago. The share of the bearish forecasts rose to 31% from 20% a week ago and the bullish forecast decreased slightly to 50% compared to 53% from the previous week. The FXStreet Forecast Poll remained prevailingly bullish for 3-month time expecting 1.2961 up two big figures from last week's 1.2763, going back to about the same level as two weeks ago. The share of bearish forecast rose to 34% from last week's 26% and the bullish forecasts decreased to 55% from 61% last week.